Retail lives and dies by cool. Concepts connect, build loyalty, and grow by being cool. They also disengage, wither, and die by not being cool. If nothing else, the history of fashion is the history of what is cool and what is desirable.But, as anyone in retail will tell you, fashion can be a fickle mistress. Every generation has had its own definition of cool, but cool constantly evolves. In today’s media-saturated age some may argue that the issue of what is cool has never been more important to consumers, nor has it ever been as likely to change with lightning speed as it is now. 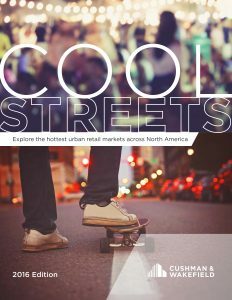 If retailers live and die by cool, the same also holds true of retail properties, shopping centers and entire neighborhoods. Whenever we speak about real estate, the issue of location and a number of other factors come into play, but the reality is that cool matters. In an age of frugal consumers, e-commerce encroachment, and vast gaps in performance between trophy malls and Class B and C centers, cool matters now more than ever.